The fact that every single reader knows the name of the phone above is pretty impressive in itself. 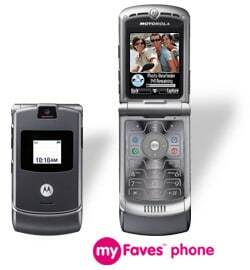 Not so long ago the Motorola Razr was the coolest thing to have. Kids begged for it, adults wanted one, everyone was clamoring for this new, cool Motorola phone. This news is coming out of Motorola, and not T-mobile, so those that would like to remain in denial, please do so until an official T-mobile announcement is made. The Razr has been one of T-mobile’s best selling phones since its release in July of 2005. But like any great phone, a downfall is inevitable. Coming Q3 of this year, T-mobile will discontinue selling the Motorola Razr V3. Some may mark this as the end of an era. Some may wonder what will come of T-mobile after the Razr is gone. Here at TNews we want you to keep your head up. The future looks bright, and as one door closes, many more may open. Our advice: stock up now, because unlocked Razrs are definitely not selling on Ebay for less then $40. I am a rep @ a t-mobile retail store, and all i can say is good riddance, ive been trying to steer my customers away from this 3+ year old device and into something more modern, say a 6133 or samsung t639. Don’t let the door hit you on your way out razr!! !, hopefully they’ll pull the rizr too while they’re at it. both of those phones are nothing but problems! !